I was walking past Gallery Project on Fourth Ave. yesterday and imagine my surprise when I saw a cast of a Basilosaurus skull in the back of the gallery. The picture above is not of a Basilosaurus but some modern cetacean; the camera on my cellphone is not great. Anyway, it was pretty exciting. Basilosaurus is one of my favorite prehistoric whale genera. 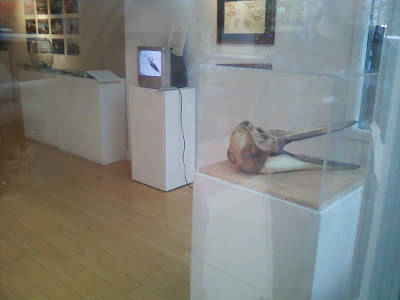 Gallery Projects current exhibit is UMWELT (Subjective World) a collaboration between artists and scientists that explores the way animals perceive their world. Looks pretty cool. Also, if you want to see a full Basilosaurus, there is one hanging at the Exhibit Museum of Natural History on the 2nd floor!